Archery is not just for adults. Archery is also a rewarding pastime for the young to participate in, and that is why Medieval Archery offers a full range of youth archery gear. This way, any intrepid young archer can begin to hone their talents as an archer using high quality gear that will provide them with hours of outdoor entertainment and fun physical exercise. This section is dedicated entirely to the young archers out there who need quality gear that is every bit as functional as an adults, but scaled down to suit a smaller frame and build. Our youth bows are all handmade and feature lower draw weights and draw lengths to suit a younger crowd that might still be learning the ropes, and our youth arrows are sized to fit smaller bows with lower draw lengths. 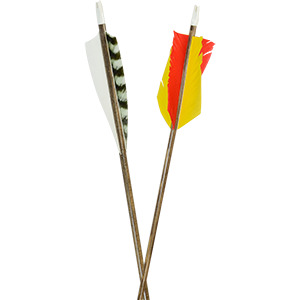 Smaller quivers fit our slightly scaled down arrows equally well, and a number of stellar archery and reenactment accessories allow your child to shoot their bow safely while showing off a look worthy of any young medieval archer. So if you know a young one that has an interest in traditional archery, than this is the place to be! After all, Medieval Archery has all the youth archery gear that your child will need to begin, practice, and even look the part! The only difference between the youth arrows offered here at Medieval Archery and the traditional arrows is that the youth arrows are scaled down slightly, so that they fit our youth bows, and consequently, fit their role. These arrows are all hand crafted in various materials to ensure that when a young archer fires them, they behave exactly like an arrow should. This ensures that as a young archer practices, they are learning how archery really works, and as they upgrade, both in bow size and arrow size, the dynamics and skills that they learned will not change. 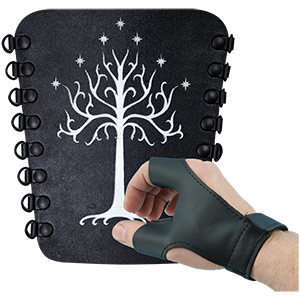 These arrows are offered in a variety of looks ranging from traditional and historic patterns to more fantasy-based designs. They are also offered in a few different materials, with the most common being wood for that classic look and feel. Some are also made with carbon shafts, for the added benefit of enhanced durability. For a responsible young archer, these youth arrows pair perfectly with our youth bows, creating a combination that allows any practicing youngster to really get a good feel for archery, while also allowing them to progress steadily towards greater mastery of the sport. You do not have to be a fully grown adult to enjoy archery, especially not when the activity itself is so rewarding and fun. At Medieval Archery, we offer a variety of youth bows that are sized for a smaller body type, so that even the young can set their sights on a target and hit it with a well-aimed arrow! In fact, many of our youth bows are similar to our adult models, only smaller! And like our adult bows, our offered youth bows are all hand crafted from fine woods to ensure that each one is an excellent all-around bow for any archer to make use of. Any one of the bows featured here, from our youth longbows to our youth fantasy bows are perfect for a young starting archer to pick up and practice with. And as they gain experience, these youth bows will remain a solid choice for continued practice, reenactments, fair events, and even competitions. So if you are an archer looking to get your kid involved, consider a childrens bow so that they can shoot arrows right alongside you! 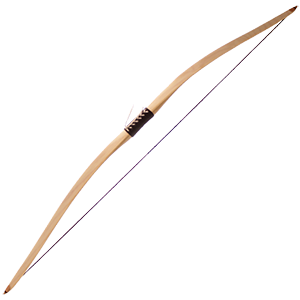 And if you happen to need a small frame longbow to suit your need, than these bows will work well in that regard too! Your child does not have to sit on the sidelines when it comes to archery. Instead, pick up a youth bow from Medieval Archery and let them join in right alongside you! For youth archery, virtually everything can be scaled down. Bows and arrows obviously change to suit their new shooter. And since the arrows changed, the quiver needs to change too! That is why Medieval Archery carries a selection of youth quivers, so that when a young archer needs to carry their arrows, they have a quiver that perfectly suits their stature. 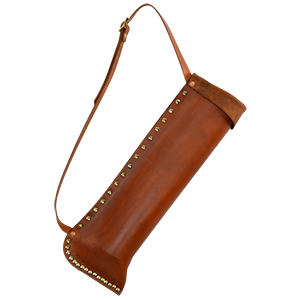 A back or belt quiver not only allows a youth archer to carry their arrows safely, but it also keeps them within easy reach, ensuring that they always have a projectile to grab when it comes to making the next shot. As their names imply, back quivers are slung over the shoulder and worn at the back, while belt quivers and hip quivers are worn at the side. All of quivers offered here are made from the very best of materials, as well as from high quality leather. 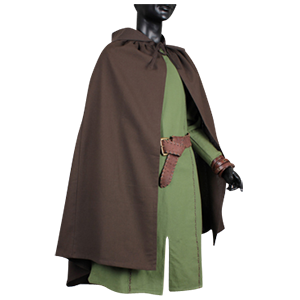 And since appearance matters as much as versatility and effectiveness, the youth quivers at Medieval Archery are also offered in different styles and patterns so that your child can look and feel just like a medieval warrior, hunter, elf archer, or anything else that suits their fancy.